To create a TIM lesson profile using the question-based method, check the top radio button for Question-based. When you have made your selections for method, school, and teacher, click the Begin an Observation button. This will begin a series of questions, each of which asks about a clearly observable activity in the classroom. This method will very quickly converge on a profile for the lesson, so you can take your time at the beginning of the observation before diving in. We recommend observing the lesson for at least five or ten minutes before you begin answering questions. Since each question after the first depends on your answer to the previous question, it’s not possible to go backwards a step in the series of questions. Therefore it’s best to take your time to observe carefully at the beginning. Figure 2. The first question. The first question will always be, “Is technology being used in the lesson/activity?” If you answer “No” there will be nothing else to observe and the system will immediately take you to the summary screen. Figure 3. The second question. If most of your teachers are at the lower end of the TIM, you will see very similar questions each time you do an observation and you will often be able to get to a final profile in as few as five or six questions. The system asks only the bare minimum number of questions necessary to determine which of the 3,125 possible TIM profiles best matches the observed lesson. As you begin to observe lessons at higher levels of technology integration, you will see an increasing variety of follow-up questions, but very rarely will it require more than a dozen questions to determine a profile. When the system has asked enough questions to determine a profile, it will automatically send you to the Lesson Summary Indicators page. Here you will see a lesson profile based on the answers to your questions. Figure 4. 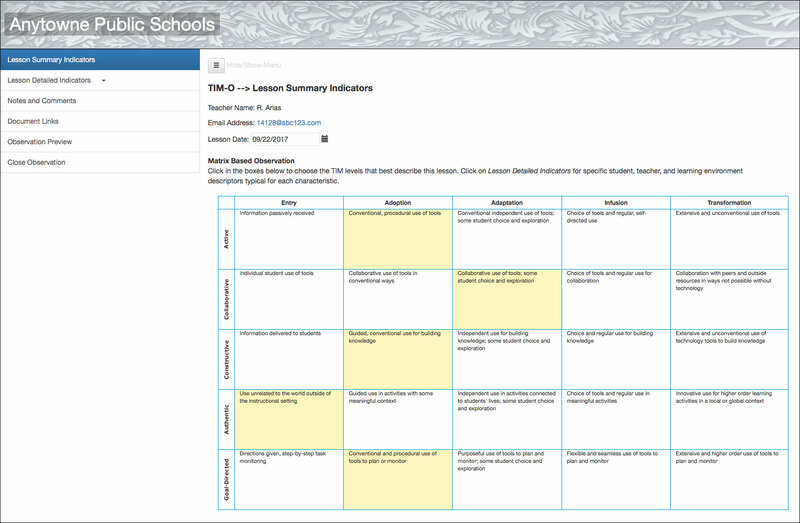 A Lesson Summary Indicators page showing the resulting TIM profile from one lesson observation.